At Moment Design I worked with a team of designers to create a tablet-optimized site for ESPN.com. 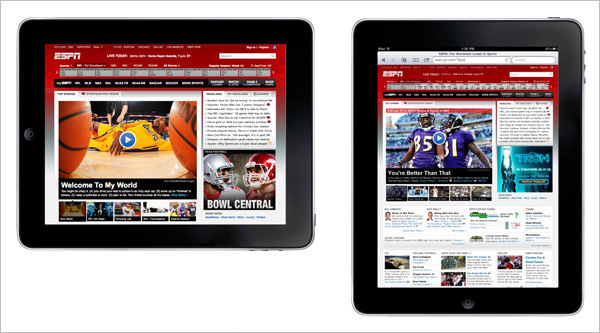 Improve usability of ESPN content and features for tablet users. Create new sources of revenue. Drive product and service innovation. Facilitate further collaboration within digital media. Capture multiple device categories/specifications with a single design. We began by testing the usability of the current site on a tablet and analyzing the problem areas. I helped with a competitive analysis of tablet-optimized sites. The team created several personas and scenarios for the large amount of content that ESPN.com offers. I helped later on in the process with refined wireframes and visual design, such as scores and video pages.